Midsummer is often a time in the garden where annual flowerbeds start to look a bit tired. That is unless you take the time to deadhead your plants. Deadheading is the act of removing spent flower blooms from the plant. To the new gardener, deadheading can seem drastic. But the experienced veteran knows that deadheading is vital to prolonging the display of beautiful flowers and to the health of the plant for a number of reasons. The annuals you plant in your garden each year really have only one mission; to produce seed during its relatively short life. If the plant is successful in this endeavor, then it has accomplished what it was born to do. Upon completion of this mission, the plant will start to decline and die. By removing flower blooms that have passed their prime, you are preventing the plant from accomplishing its sole purpose. Consequently, the plant is signaled to “send in reinforcements” by way of more flower blooms, all with the intent of producing seed. 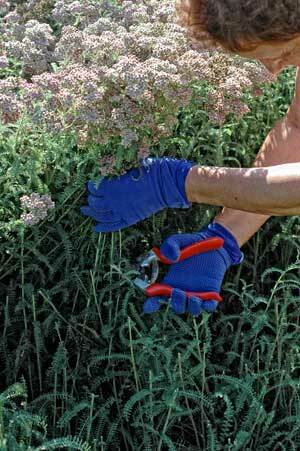 Deadheading therefore, keeps the plant in constant production mode. To our delight, the outcome is a steady show of new blooms. As beautiful as most annuals can be, too much of a good thing can be too much. Annuals reproduce by seed, and if given the opportunity, you may end up with far more plants next year than you ever wanted. However, if your desire is to have more of the same next year, then allow some of your late season blooms to stay on the plant. Whenever you deadhead, you are redirecting the plant’s energy from producing seed, to putting on new growth above and below ground. The results above ground will often be the emergence of new shoots from two or more buds rather than the previous one. When I buy annuals from the nursery, I often will deadhead most of the flower buds. This gives the plants more time to establish in the garden and creates a better foundation for season-long success. Anytime I have the opportunity to remove dead or dying plant material (including spent flower blooms) from the garden, I do it. I know that by doing so, I reduce the chances of promoting pests and disease from taking hold. An obvious reason for deadheading includes keeping your garden looking its best. Not only are you removing unsightly brown, wilted plant material, but by doing so, you are setting into motion a rejuvenation process that often creates a better looking plant, and one that is far more floriferous. Mid-summer doesn’t have to signal the end to peak flower displays. A periodic inspection of your flower beds along with some judicious deadheading will be the most important steps you can take to ensuring a spectacular season long display.